This is a scan of a stock certificate issued to a family member on January 25, 1910. 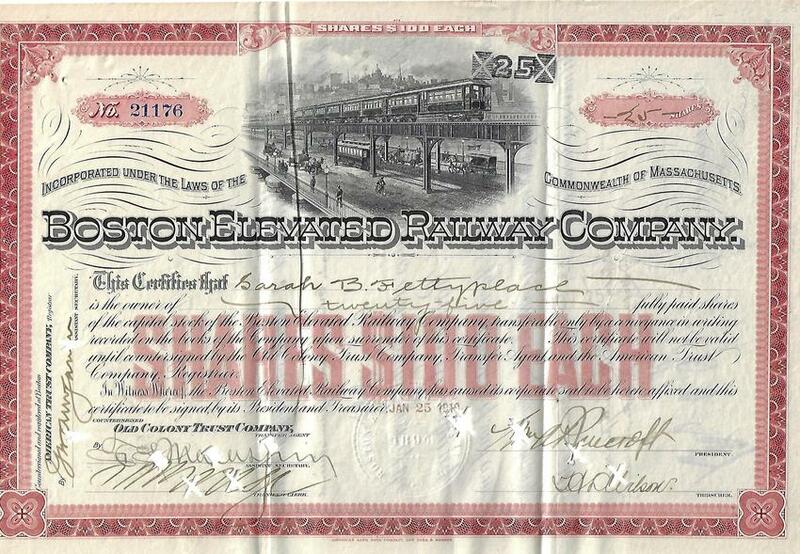 It is 25 Shares of Common Stock in the Boston Elevated Railway Company, owned by the late Sarah Burrell Fettyplace (1823-1911), of 16 Winter Street, Salem MA. On November 24, 1913, the shares were transferred to Salem Seaman's Widows and Orphans Children's Friend Society. Sarah's father was Thomas Fettyplace (1785-1826), a Seaman who worked out of the Port of Salem. Her mother was Hannah Devereaux (1785-1861), dau. of Burrell Devereux and Elizabeth Gerry of Marblehead. In 1910, the shares were valued at $2,500.00. With inflation, the shares would have grown in value to be worth $64,133.70 in today's dollars. Photographed by Scanned Image of a Stock Certificate in the posession of her family., January 25, 1910. Added to the photo archive by David Murray, July 20, 2018. Railroad: Boston Elevated Railway Company.